Through Wilfredo Arias brush a colorful and vibrant history is not only expressed but enriched and enlivened. In the tradition of Polke, Tapies, Bueys and Twombly, Arias infuses his artwork with humor, pathos and beauty. 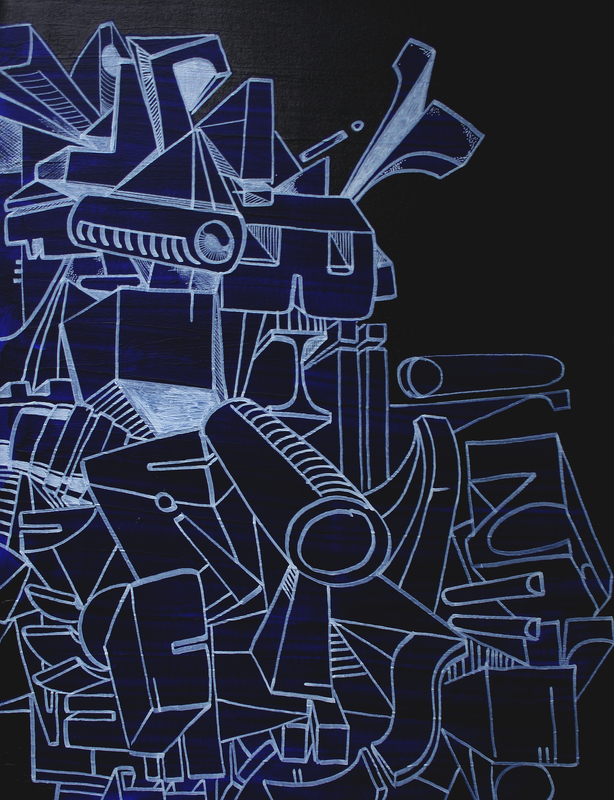 On his canvas; oil, acrylic, charcoal, and spray enamel find themselves communicating the immediacy of an urban and idiosyncratic environment. Indeed, says Arias, “I am always searching for some source of inspiration in everyday life, a drip, a scar, a crack, something.” And, like Tapies fleshy textures, Arias’s work distills the sensual from the quotidian. Spectrometer (2002) is emblematic of Arias’s alchemical dexterity. Violence, in all of Arias’s paintings, is an implicit promise lying beneath the cacophonous symphony of shapes and colors. Arias, though, has some how redirected this element into a creative force. A sort of pulse and hum of cars, the staccato conversations shouted from windows–the city lives in Arias’s paintings through this violence, through the scars, the drips, the frenetic beauty of everyday life. Yet as violence exists on a continuum from gentle caress to blistering rage, so too does Arias’s work. Humor peeks out from the busy patois of juxtaposed colors; grins at the gentle allusions of everyday things and delights in the double entendre of his forms. Delicacy, a gentle breeze, can be felt in the carefully placed alleys of scratched paint. Subtlety quietly suffuses Arias’s work; his colors recall lullabies, melancholia, the last few seconds before it rains when, in the thick silence, energy is almost tangible and violence palpable. Arias’s genius, like that of Hitchcock, lies in his keen perception that implied violence is much more powerful than explicit violence. His paintings capture that moment of suspension when playfulness, gentleness, vibrancy, and strength raise their voices in beautiful prayer heard daily on the streets of the city.